Staind frontman Aaron Lewis had a scare on Saturday (Sept. 20) when a private charter jet he was a passenger on was disabled, resulting in a flight cancellation. 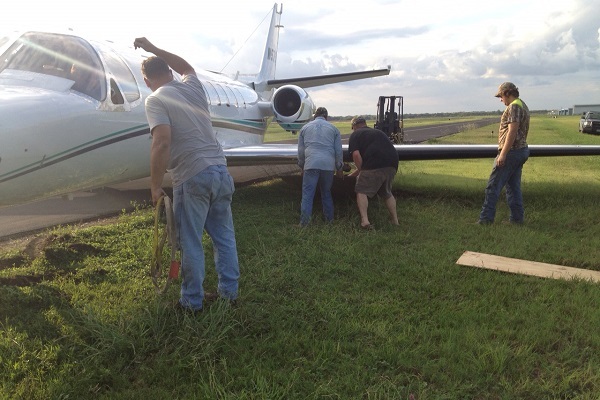 Lewis was filming a segment for his Sportsman Channel TV show “On the Road” when error caused the Cessna Citation V jet to veer off the taxiway and get stuck in mud, which put a nix to his flight plans. After the taping of the reality hunting show, Lewis was supposed to depart for Tulsa, Okla., and perform on Brantley Gilbert’s “Let It Ride” tour at the BOK Center. He obviously didn’t make the trip, due to the flight mishap, but promises to make it up to the people of Tulsa. In other Lewis news, the Staind singer is booked for a string of North American tour dates in support of his solo, country career through next spring. For a complete list of upcoming tour stops, visit his official website.